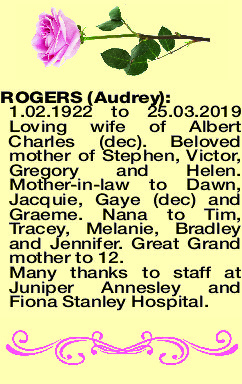 ROGERS AUDREY 1.02.1922 to 25.03.2019 Loving wife of Albert Charles (dec). 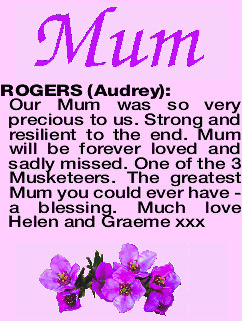 Beloved mother of Stephen, Victor, Gregory and Helen. 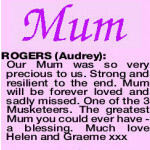 Mother-in-law to Dawn, Jacquie, Gaye (dec) and Graeme. Nana to Tim, Tracey, Melanie, Bradley and Jennifer. Great Grand mother to 12. Many thanks to staff at Juniper Annesley and Fiona Stanley Hospital.